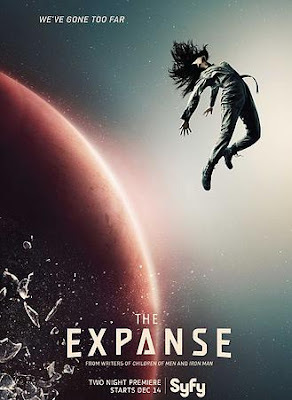 I know I haven't said much about The Expanse, neither my visit to the set nor the cast and crew premiere here in Santa Fe the week before last. Suffice it to say, it's awesome. By now I hope you've watched the pilot at least??? I spent my time on set looking for someone to interview especially for my followers. That person turned out to be Elias Toufexis, who plays the character, Kenzo. I've heard several people freak out about this character because he's not in the books. So Elias and I sat down over Skype to discuss the creation of this character. James SA Corey (aka Daniel Abraham and Ty Franck) were squarely behind the decision to create this character and even developed him specifically for Elias after seeing him audition. Aside from his work on The Expanse, Elias has had a recurring role on Bitten and is playing the lead in both the latest Deus Ex and the latest Far Cry installments. We also discussed his performance capture work, and then just like with all my interviews, I asked him a bunch of really basic questions about building an acting career. As with all my interviews, if you click over to YouTube and expand the description, there are hyperlinks that will jump you to whichever parts of the interview you want to see most.